Home Shop NewsHoliday tattoo gift certificate specials!! Holiday tattoo gift certificate specials!! Our annual holiday special is on! They may be a great stocking stuffer, but use it within 90 days* from date of purchase, and it’s worth even more! $130 = $150, $260 = $300, $390 = $450! Does your friend, family member or special someone have a big tattoo they’d like to start the new year with? Now’s the time to get the most for your money! This offer valid November 25th through December 31st, 2014. *To take advantage of holiday tattoo gift certificate specials, gift certificate must be used within 90 days from date of purchase, or will revert to face value only. Bonus value does not carry over to remaining balances if any. 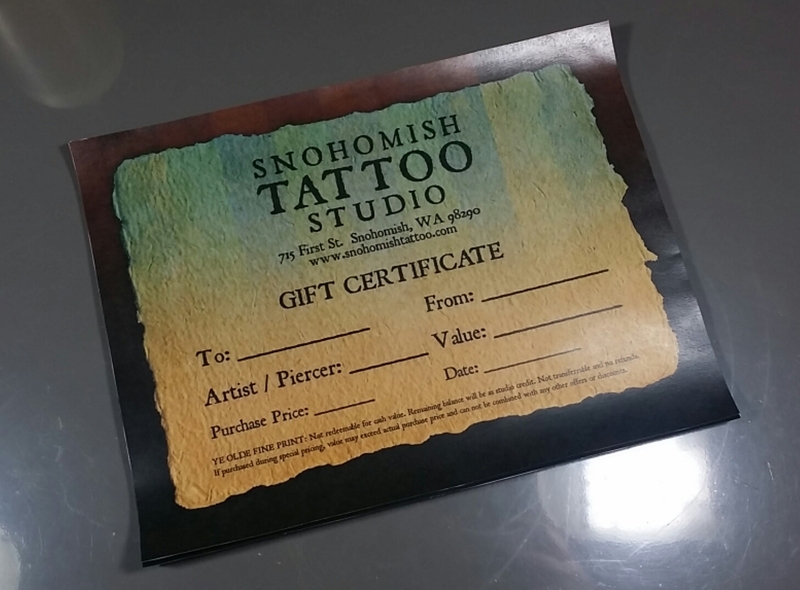 Gift certificates are valid with intended artist/piercer and customer as specified at time of purchase and may not be used in conjunction with any other products, offers, discounts, or purchases other than as specified. Value is not refundable or transferable. Previous Previous post: Halloween Tattoo Specials! Next Next post: Fresh ink!